Phil welcomes the “most competitive” Racers ever to the public Starting Line for the milestone 30th season of The Amazing Race. After handing out a hot dog, he points the teams to their clues waiting in the fountain. And that clue tells teams their first destination is Iceland. All teams are on the same flight and once they arrive in Reykjavik, teams must hop into a non-sponsored Toyota SUV and drive themselves to Geitárgljùfur. Yale debaters Henry & Evan arrive first and learn that one team member must Tyrolean traverse across the river canyon to retrieve an Iceland flag in the middle. Big Brother lovebirds Cody & Jessica and Indy car racers Alex & Conor are right behind them as they must now drive to Esjumelur for their next clue. NBA All Stars Cedric & Shawn and champion skiers Kristi & Jen are next. Meanwhile, ring girls and models Dessie & Kayla, competitive eaters Joey & Tim and goat yoga moms April & Sarah are lost on the way to the canyon. April & Sarah begin to get testy with each other as they try figuring out where to go. Henry & Evan arrive at the next clue which is the first Road Block of the Race: Do I Have to Spell It Out? 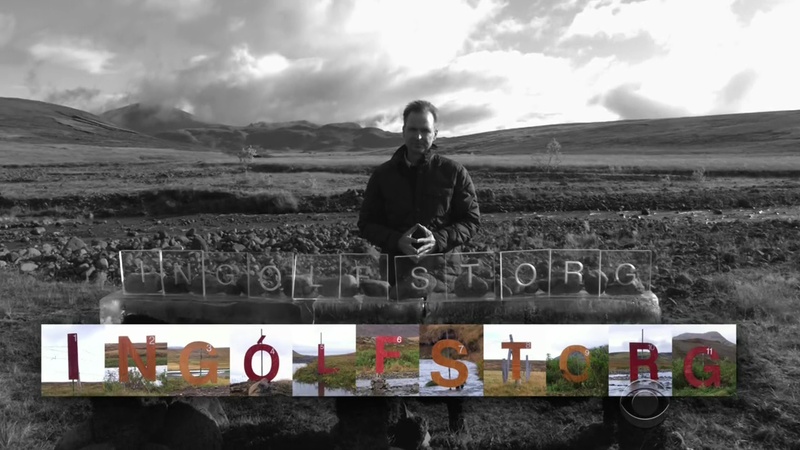 For this Road Block, teams will ride along in an off-road buggy across a riverbed, keeping an eye out for letters which they will need to spell out Ingólfstorg, a square in downtown Reykyavik. Each letter has a number which will help teams put the letters in the correct order. Evan heads out on the course first and is able to return as Conor and Cody set off. Evan tries a first spelling, but he has switched the two Os, one of which has an accent. Cody is able to finish on his 1st (?) attempt and he and Jessica and now drive back to Reykyavik and to Ingólfstorg where they will meet Katrine among some modern day vikings. She will ask them two questions which will help teams identify two Iceland tonics: brennivin and cod liver oil. Jen and Shawn are next to start the Road Block followed by violinist Trevor. 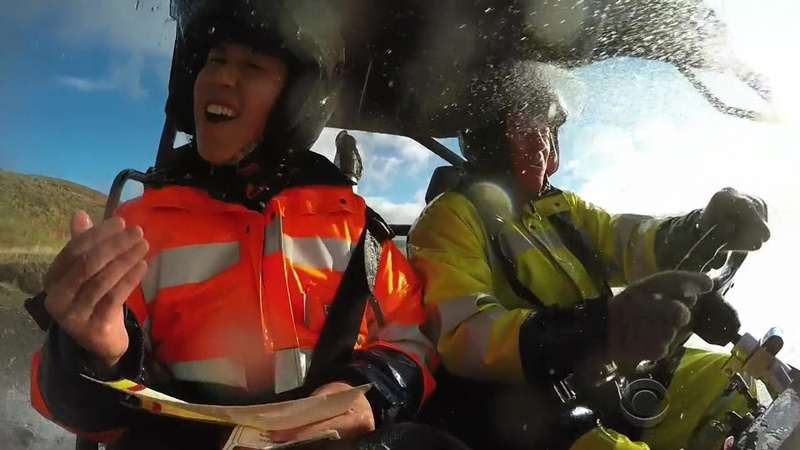 Henry and Jen are 2nd and 3rd to finish and drive to Reykjavik. Cody & Jessica gets the two questions from Katrine: What do Icelanders call the “Black Death”? and What is Porskalysi? They ask the locals who give them the answers. They report back to Katrine who confirms they are correct, gives them a shot of each drink and the next clue. That clue tells them to make their way on foot to the Pit Stop by Lake Tjörnin. But Cody & Jessica get lost trying to find the lakeshore. That allows Kristi & Jen to pass them and step on the Mat as Team #1. Phil says they have won a trip to Santorini. Cody & Jessica settle for 2nd, Henry & Evan take 3rd and Trevor & Chris finish 4th. Alex & Conor step on the Mat as Team #5, Joey & Tim are 6th, Lucas & Brittany are 7th. Back at the Road Block, teams are coming and going. Shawn and Sarah are the last ones left. Shawn does not see he has switched the two Os. Cedric yells over to him to check his “Os” and “Ps”, but doesn’t seem to hear. Shawn and Sarah decide to compare. Shawn tells Sarah the letters she’s got wrong, based on his memory of the numbers. Sarah asks a check and it is correct. Shawn goes back to his word and he believes it is exactly the same. He compares their answers again and notices the accented O. He finally corrects his mistake and gets the thumbs up. Cedric & Shawn, twins Eric & Daniel, April & Sarah, Dessie & Kayla are lost on the way to the square. Cedric & Shawn manage to arrive at the drink first and head to the Pit Stop. Phil welcomes them to the Mat, but cannot check them in because Cedric “helped” Shawn at the Road Block by yelling out advice. Cedric & Shawn try to plead their case, but Phil is not having it. They have to wait out a 30-minute penalty. Eric & Daniel walk up and can check in as Team #8. April & Sarah and Dessie & Kayla are neck and neck as they finish and run to the Pit Stop. Phil points out to Cedric & Shawn that the two teams are within sight. The seconds count down on their penalty and Phil officially checks them in as Team #9. Just a couple of seconds later, the last two teams come running up to the Mat. And it is the first photo finish elimination in Amazing Race history. Phil confirms that Dessie was the last to step on the Mat. That means April & Sarah are Team #10 and Dessie & Kayla are eliminated. And so the milestone 30th season of The Amazing Race is finally here. It actually doesn’t even feel like a long time since the end of TAR29. I tweeted earlier that this is the first time in the show’s 17 year history that I wasn’t all that excited or hyped to watch an American Amazing Race premiere. And that actually made me feel a little sad. Of course, I’m still happy and thankful that somehow, someway The Amazing Race still has a time slot on CBS. But at the same time I almost get the feeling that the end really is near for the show. And that me feeling this way is just me coming to terms with the idea and the very real possibility. But until then, we have season 30. A season that has been billed as the most competitive season evah. Or at least the most competitive cast evah. Well the premiere certainly didn’t show that. And right off the bat, I’ll say the premiere was a pretty standard contemporary TAR premiere. 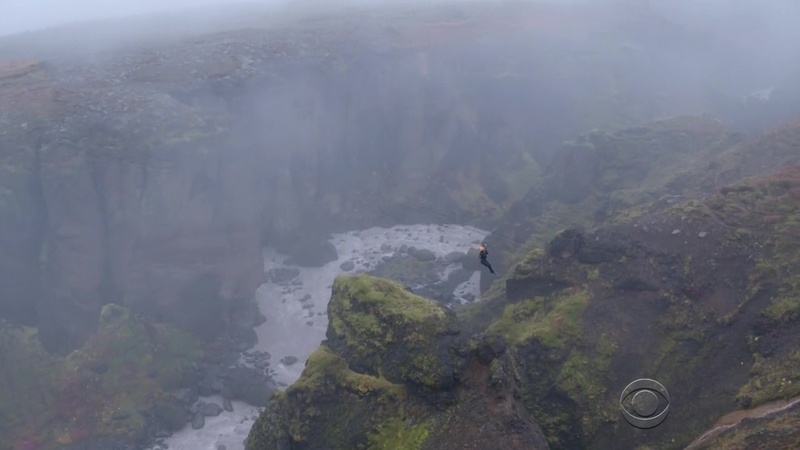 The standout positives for this episode definitely have to be the stunning shots of Iceland. That first task traversing over the waterfall canyon is definitely the kind of thing that you want as a first task on any Amazing Race premiere. Especially an Amazing Race that is trying to capture viewers and get them hooked. It might not be the most fresh or original task, but it allows for this stunning cinematography that has been one of the hallmarks of The Amazing Race shine. When all else fails, the least The Amazing Race can do is to be the amazing travel show that it can always be. But being the first visit back to Iceland after all these years, one would expect there to have been a much better feature of the country. Especially as Iceland has become a favorite tourist destination in the US the last few years since season 6. The Road Block was actually pretty good as it was a thinking task right on the first leg of the Race. Simple memorization, sure, with a little bit of trickery. But it’s a good first Road Block. If only it was paired with maybe another significant task or even a Detour. That last task in Reykjavik was a solid extra Route Marker. But certainly didn’t help to make the Leg feel a little more full. Maybe there was another task somewhere on this leg? The teams seemed to have been carrying shopping bags from 66°North in Reykjavik for some reason. Or just some extra product placement from the local company who provided the teams’ cold weather clothes. 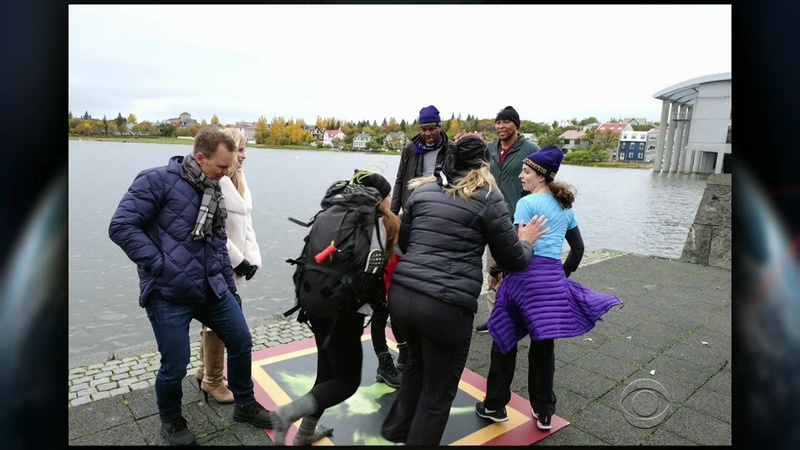 But again for The Amazing Race which needs to somehow miraculously find at least a million new viewers, this premiere Leg needed to have much more of a hook. And unfortunately it didn’t. Which is surprising and not surprising at the same time. Now the final few seconds were definitely very exciting. It was truly the closest finish ever on the show. You couldn’t have scripted that better if you tried. But that’s just a one-time thing. You’re not going to get that kind of photo finish foot race every single Leg. Especially if the show insists on staggered start times again as they’ve done so much in the recent seasons. TAR needs to continue to be less strict in avoiding crew from popping up in shots. They lose a lot of great footage otherwise. Anyway, back to the Starting Line. Having these open Starting Lines have always been fun. And this being the 30th season (though it doesn’t feel like it), it’s a nice treat for fans to be a part of. Thank goodness they got rid of the Opening Credits of Doom! Finally a real update to the opening. Though the poses felt very-BB like. The background graphics were also much better than the strange floating passport stamps of recent seasons. 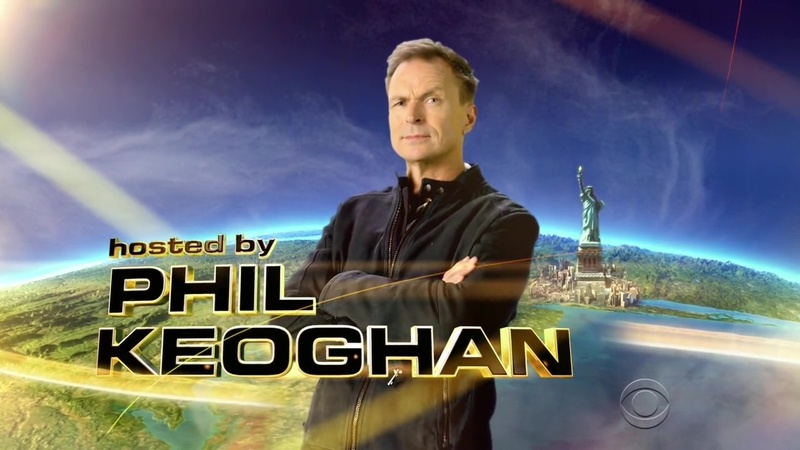 And it’s pretty awesome to include Phil in the opening finally. Speaking of intros, what was that first 10 minutes?! Those were some horribly contrived self-introductions (written by the show, most likely). Those one-liners! I don’t think the team intros have ever been that cringe-worthy. Overall, this was just an okay premiere. The editing was kind of all over the place. Also something seen in recent season. But really, I don’t know if the episode had anything that would bring in any new viewers that the show desperately needs. Or heck, retain the possible new viewers that might have tuned in. I won’t even start on the Double Battle/Face Off/Duel Duel creeping its way onto TARUS finally until we actually see the likely mess next week. As for the teams, I don’t really have a good read on any of them, esepcially after the horrendous intros. So the rankings above are meaningless at this point. Right now I think I’m rooting for the Yale debaters and the skiers. They seem like great, strong competitors who won’t be boring racebots. Alex & Conor have potential to be like that as well, but they were a little on the blander side this premiere, despite Phil pointing out the couch situation at the Mat. April & Sarah’s random bickering was amusing for the most part. Don’t really know much about Cody & Jessica since I didn’t watch BB last season. The only thing I knew about them (through Julie Chen and Rachel’s tweets lol) was that people apparently hated Cody’s horrible personality until he became the underdog and then everyone loved him. I do find it funny that Phil repeatedly calls them the “paprika” of the cast this season, basically saying they are completely out of place and only added in at the last minute. Anyway, they were pretty meh this episode, much like everyone else. Joey & Tim, Eric & Daniel and Trevor & Chris were all almost invisible this Leg. Cedric & Shawn were a little disappointing. They’re definitely a team I expected to do a little better. Wasn’t really a fan of Shawn going over to copy the answer after Sarah left, but I also think the penalty was kind of nonsense. Dessie & Kayla could’ve been interesting to see continue on a few more Legs. But it was just an unprecedented elimination. And finally, Lucas & Brittany are a sort of-typical bickering couple, except Brittany totally has Lucas under her thumb. That could be an interesting dynamic and different one for a couple team. Overall, an okay cast, mostly in line with recent seasons and really no indication, from this first Leg, of being “most competitive” and whatnot. I thought it was a really poor start for the season. It certainly didn’t draw me in. Perhaps that is simply the cast haven’t had a chance to get on me, but it did feel rushed. I realise it may be harder for TAR to get a two-hour start every season, than it once was, but I really miss it. I agree. The first 2 episodes really did not do a good job of really introducing the teams. TAR was able to do that with even just 1 hour premieres before. But not here. Maybe it’s a combination of editing and the cast themselves? I find it very hard to believe that you can’t film an episode and have no ability to show what the teams are like. Even the most boring person could be filmed and made interesting. I think the problem lies with the fact every team has a gimmick more and more now, and teams are even given team names rather than being made by the teams. It’s like the production team are saying that they don’t need to do more, as you already know enough as a viewer from that. I also think, the lack of airport drama costs this. In the first couple episodes, it seems as though the teams have been just given airport tickets, so they are in no rush to get to the airport. This kills tension at the airports, and a chance to see personalities. Yeah, they can certainly do anything with editing. But editing has been up and down the last couple of seasons.